Each of the qualities on The Positive Qualities Chart represents a common value that you can choose to possess. If you have experienced that quality, you have given it meaning. As you acquire a new value, you are growing. Look at the difference in your self from ten years ago. You have changed, matured, and learned because of what you have chosen and by how you have acted and reacted. These experiences have altered your being. You are becoming a new person; a better person; a person who is willing to share your highest ideas and ideals. Each one of us is a combination of physical, mental, and spiritual characteristics. In order to be a harmonious blend of these factors it is best to include a diverse range of qualities. Whenever you choose good over evil, better over good, or best over better, you are acquiring these virtues, and moving toward your ideal self. You may be motivated to acquire positive qualities for many reasons: self-improvement, tradition, family customs, service to and love of humanity, religious requirement, spiritual progress, etc. In the end your reason is personal. Just by living on this interesting planet, we are acquiring qualities. Yet you can be an active or a passive participant in your own growth. Our human nature desires others to treat us with kindness, fairness, decency, and compassion. Our higher nature desires to direct these same qualities toward others. The qualities and what you decide to do with them are what are important. Proceed with your own positive growth for your own personal reasons. All that we are is the result of what we have thought. What we think, we become. — Buddha ─ circa: 500 B.C. Love, Truth, Beauty, and Goodness are the foundation upon which all qualities are built and the culmination of all reality. If these are the central values, what others are important and what would be their relationships? The Chart and book are my answers to these questions. There are 1,000 qualities on the Chart which took six years to catalog, organize, and design. Each quality is situated within a wedge of related qualities. These relationships flow out from and into the center — a sort of visual thesaurus. The size of each word depends on how many qualities are behind it. Its position in relation to LOVE represents its relative significance. But always remember: The most important qualities are the ones you are living this moment. Use the Chart as a personal reminder to focus on the positive. Simply by living them you share the positive qualities you possess. It is also fun and important to reveal your personal experiences and insights with friends. Living the positive is a hands-on (or should we say a soul-blossoming) method of becoming. It is a means of expressing your belief and keeps you moving the right way through your life. The Book of Positive Qualities is currently out of print, although copies may be available at used bookstores or on the Web. The book explains the philosophy of being positive in all aspects and situations of life. Each word is defined and many have quotes, ideas, and comments on how to bring the qualities into your soul. We become what we focus on. Each week pick a couple of qualities from The Positive Qualities Chart to ponder and to emulate. You can act passively or actively. Passive action is simply noticing as the qualities come across your path. They present themselves as opportunities. Or you can take decisive action to use the qualities you choose. Please contact me to be added to the growing list of people who enjoy the qualities sent to them directly (each Sunday). I will not sell, trade, or give your address away. Since each pair is randomly chosen, they may be compatible or dissimilar. There is no need to try to force them to work together. But it is sometimes fun to see how you can harmonize them. 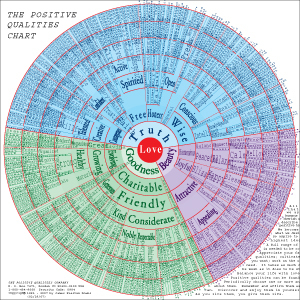 This sample list contains 108 out of the 1,000 Positive Qualities on the Chart. Choose a couple of qualities to emulate and see how you become more than you are. You can jump to the entries from The Book of Positive Qualities for the highlighted words. An exercise you can do right now is to put the words "I am or I have" in front of each quality. Listen to your inner truth sense. Act upon the images, memories, and feelings which you experience.